John Gardner Sr. purchased the lot that on Essex Street in the mid-18th century and sold it to his son, John Gardner Jr. In 1804 Gardner built the opulent three story federal style mansion. However, a few years later after falling on heard times the house Gardner sold the house to his brother-in-law, Nathaniel West. In 1814 Captain Joseph White bought the house. However, in 1830 White was murdered in the home and it quickly became the talk of Salem. Captain White was a wealthy, retired sea captain who made a killing as a slave trader in the early 19th century. He lived in the mansion with his niece, Mary Beckford, who served as his housekepper. Benjamin White, a distant relative also lived on the property and served as a handyman along with a servant named Lydia Kimball. At 82 years of age his family was waiting for him to die so they could collect their inheritance. On April 6, 1830 Benjamin White awoke to discover a window had been opened. He and Lydia Kimball quickly went upstairs to check on Captain White only to find him bludgeoned and stabbed to death with blood covering the bed. Salem was buzzing. One of the richest men in town had been murdered in his sleep and it was the talk of the town. Things got even crazier when Captain White’s nephew by marriage (Joseph was married to Mary Beckford’s daughter), Joseph and his brother, John Francis Knapp went to the authorities to report that they had been robbed by three men just outside of Salem. Law enforcement was stumped and had no clue how to solve the case until an inmate came forward with information. The man wanted to make a deal to get his sentence reduced so he told the police what he knew. A man named Richard Crowninshield killed Captain White. Around this time a friend of Crowninshield started sending letter to the Knapp brothers asking for money and threatend to reveal information about them to the police. When the Knapp brothers father saw the letter he went to law enforcement about the extortion attempt. The Committee of Vigilance sent a check to a post office in Maine and arrested John C.R. Palmer when he tried to retrieve it. Palmer was arrested and charged as a possible accessory to the murder unless he cooperated with authorities. Facing a lengthy sentence Palmer spilled the beans and told officials everything. The Knapp brothers had offered $1,000 to Crowninshield if he would murder Captain White. The Knapp brothers were arrested and thrown into jail. Joseph Knapp confessed to paying Crowninshield after sneaking into his uncle’s bedroom and stealing what he thought was his will. Without a will all the Captain’s money would be divided up amongst all his heirs, which included the Joseph and John Knapp. Mary Beckford would also receive a large sum and Joseph would get to double dip since he was married to her daughter. Unbeknowngst to them Captain White’s will was in his lawyer’s office and it mandated that his fortune go to another nephew he favored over Mary. While awaiting trial Crowninshield hanged himself in his prison cell. His death made things hard for the prosecution but after two trials both Knapp brothers were found guilty and sentenced to death. Joseph and John were hanged together on the same scaffold. The entire fiasco left a scar on Salem and also impacted people in town as well as the world. Captain White’s murder inspired Edgar Allan Poe to write ‘The Tell-Tale Heart’ as well Nathaniel Hawthorne’s ‘The Scarlet Letter’. Local businessmen George and Charles Parker were inspired to buy the rights to an English game called Cluedo. The Parker Brothers renamed the game ‘Clue’. The Gardner Pingree House was the model for the storyboard. So if you guesses Captain White was murdered in the bedroom with a club a knife you would win! After White’s murder the house was sold to local politician and future mayor of Salem, David Pingree. The property changed hands several times until it was donated to the Peabody Essex Museum in the early 20th century. 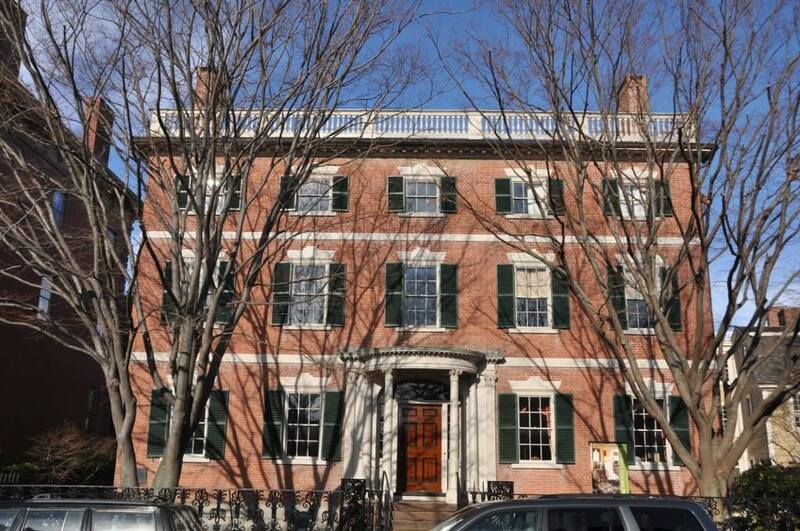 Due to the gristly murder of Captain White many believe the Gardner-Pingree House is haunted. Volunteers at the museum have claimed to hear footsteps and other strange noises inside the house when tours are not taking place. Objects in the home sometimes get moved around and turn up in different places from time to time.